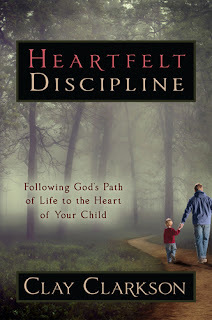 Heartfelt Discipline: Following God's Path of Life to the Heart of Your Child by Clay Clarkson has been one of the best books I have read lately, but especially in the parenting genre. I can't say enough about how important the truths regarding discipline are that I learned in this book. As a Christian parent, I don't have the option of whether or not to discipline our children. My husband and I are commanded in Scripture to instruct and teach our children, but what does that look like? Clay Clarkson, author of Educating the Whole Hearted Child and father of four, takes a fresh look at parenting and re-evaluates some of the quick, go-to methods that we have a tendency to use in our parenting. While Scripture is very clear that we must "bring [our children] up in the discipline and instruction of the Lord" it isn't especially clear on how to discipline them and we need to be careful not to resort to what comes naturally to us, but rather to the principles that God has laid out for us in His Word. Heartfelt Discipline helps us take a look at what the Bible says about childhood discipline and allows us to see that God has provided a way to biblically discipline our children as we walk our own path with God. This approach to parenting doesn't rely on methods, but rather on our faith in God, our relationship with him, the Holy Spirit and and the heart of both the parent and child. Protection--Guarding them from temptations that could draw them away. This is not a quick read. At least it wasn't for me! I found myself pausing frequently to mull over what I had just read, to stop and confess areas where I focused on the urgency of getting the discipline over with rather than the heart of discipline, or to stop and pray that God would help us to grow in specific areas. If you have a heart for your kids and want to help them grow in their walk with Christ I think you'll really benefit from this book. If you'd like to order a copy of your own Heartfelt Discipline, stop by www.wholeheart.org to get yours today. I hope you found this review helpful and encouraging.